President Obama will intervene in the development of national drone regulations, issuing an executive order granting the National Telecommunications and Information Administration, part of the Commerce Department, the mandate to develop privacy rules governing commercial drone use. The Federal Aviation Administration has been criticized for being slow to develop privacy rules for commercial drones. According to Politico, the White House confirmed that it is pushing to coordinate efforts among the federal agencies on the issue. The Jordanian military shot down a drone over the border with Syria. “Any violation of the kingdom’s border will be dealt with firmly and forcefully and the armed forces will not allow any tampering with the security of the country,” said Mohammad al-Momani, a government spokesman, in an interview with Reuters. The Organization for Security and Co-Operation in Europe is seeking two surveillance drones to monitor the crash site of Malaysian Airlines flight 17 in eastern Ukraine. According to an unnamed source from OSCE who spoke with IHS Jane’s, the OSCE has invited companies to submit bids for two UAVs to patrol the area of the crash and provide aerial protection for OSCE personnel. Open Source Imagery Intelligence blog features a YouTube video that appears to show an American Predator drone flying over Anbar province in Iraq. The Washington Post has a map of the all of the areas in the U.S. where it is illegal to fly a drone. 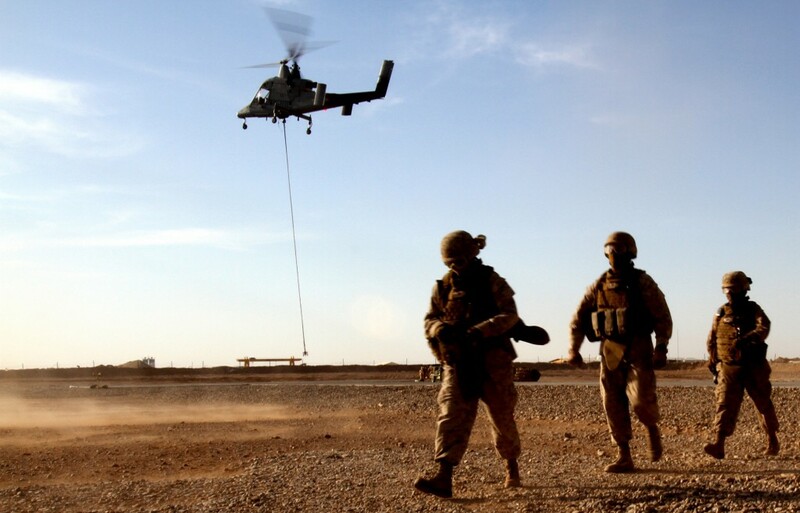 As the United States withdraws from Afghanistan, the Washington Post’s Dan Lamothe examines the role that the K-Max unmanned helicopter played in closing down bases. At Defense News, Paul McLeary writes that American and Iranian drones are carefully avoiding each other in the air over Iraq. At the Bureau of Investigative Journalism, Alice Ross looks into American drone operations in Afghanistan and explains the difficulty of obtaining data on strikes. At Al Jazeera, Chase Madar argues that CIA drone strikes really do feed extremism. Drone Selfies is a project by the art collective IOCOSE in which a Parrot quadcopter drone poses as a self-obsessed teenager. “We imagined what would the ‘life’ of a drone be like in an alternative present where war and terror were over,” said Filippo Cuttica of IOCOSE in an interview with the Creators Project. At the Guardian, Spencer Ackerman looks at the U.S Navy’s efforts to develop a carrier-based drone. At the Drone Girl blog, Sally French offers a few resources resources for the first-time drone buyer who wants to make aerial videos. At CNN, Priya Satia explains how the drones of today have roots in the birth of airpower during the First World War. At LA Activist blog, Dan Bluemel provides an update on grassroots efforts to prevent the LAPD from flying drones. At Motherboard, Shawn Musgrave reports on the FBI’s refusal to release information about its drone program. At GreenTech Media, Jeff St. John considers how drones could prove useful for energy utility companies. Versus profiles the Prox Dynamics Black Hornet, a tiny camera-equipped military drone that weighs as much as three sheets of paper.